Korea & Animation: Bee Different! Bzzzzzzzzzz. . . Bzzzzzzzzzzz. . . I'm not a human! I'm a bee! Bzzzzzzzzzz. . . .
Why do we make animal cartoon characters human? We always tend to anthropomorphize them; give them human qualities. However, why don't we borrow from other animals instead? All I know about this bee is that it is the mascot for 1001 Angyeong Contact, an eyeglasses shop. Isn't its design intriguing? It has a mouth and nose which appear to be from an otter. Most bee cartoon characters I've seen borrow human faces--human noses, mouths, maybe even teeth or a head of hair. Maybe I'm mistaken and this is just an otter in a bee costume. 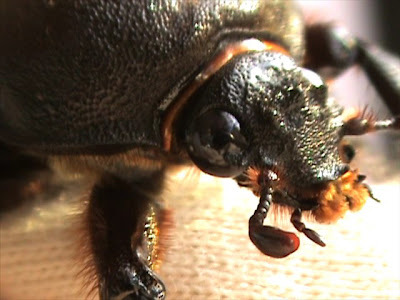 Take a look at this extreme close-up of a real female beetle. See how her mouth is more like the muzzle of an otter than the mouth of a human? The button eyes more closely resemble an otter's than a human's, as well. So I think this bee design is quite brilliant! I know nothing about the background of this bee's design, however, it encourages me to think outside the stereotypes of cartooning. There are all sorts of possible ways to represent a bee. We just have to see different and bee different! Fascinating...by the way, your late beetle is adorable. My goldfish, Hannah, looks a little like a lion; her gill covers and front fins fan out to make a mane-of-sorts. But even so, I did not name her a lion name, I named her Hannah--a name typically associated with humans. So why do we name our pets human names? Why do we attribute human feelings? Why do we even speak to them in human languages--I mean, why don't I ever try barking at my fish or moo-ing at my dog? I think I will try this out and "Bee different". Thanks for the thoughts. Wow! That beetle is hilarious. I was so shocked when I saw it. It looks cool, though. My pets at home have human names as well, except for Simba, who was named after a famous Disney animal. However, if you know of anyone with that name, let me know! Ha ha! I didn't even think about humanizing pets! 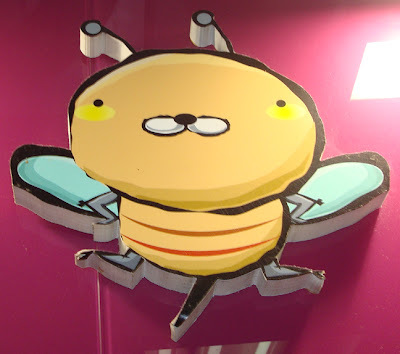 I was just thinking about cartoon character design and the idea of incorporating animal features into other animals rather than human ones, like in that bee mascot in this post. I guess the goal of designing a character is to make them relatable. I think this bee is relatable, and without the human mouth, nose, hair, and so on. Now naming things nonhuman names. . .
Wow, this is a really brilliant observation! I like how you're thinking outside of a box that many people don't even realize is there. I'm definitely excited to think about the ramifications! I like how you even did your homework with the real beetle too.